Source: ARC provided by the publisher in exchange for a fair and honest review. When I first saw this book, I was super pumped for a book that delved into a situation where two friends--a guy and a girl--crush on the same guy. Of course, there was lots more I expected, but THAT was what originally grabbed my attention. Also, the tagline: "What if getting the guy means losing your soulmate?" I was so excited, looking forward to picking this one up and going through it all with the characters. Turns, out this book was so much MORE. 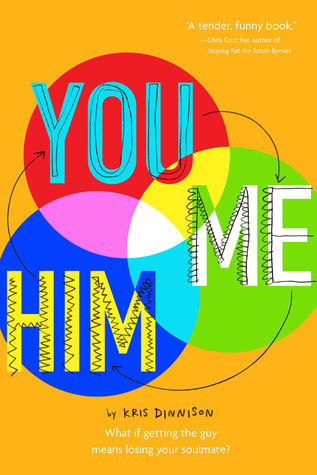 You and Me and Him not only delves into a situation where two friends--a guy and a girl--crush on a guy. As I said, I'd expected more... but actually EXPERIENCING that was a whole different thing, and I loved it. While I'd originally been most interested in the situation with liking the same guy, I ended up being the most fascinated with the friendships. Particularly, Nash and Maggie. Their relationship is literally one of my favorite things. Quirky and fun and incredibly heartwarming. They are so well matched, and their dynamic made the original premise so much more cool to read. The characters really shined, too. Maggie hit me as a narrator I'd enjoy right off the bat, starting from the first sentence where she tells us she's not "one of those shrinking-violet fat girls." From there, she continued to win me over. Sure, she was definitely not perfect--but she was real and I so understood her. That said, Nash was my favorite character. He was cute and nice and I want him to be my best friend in real life so bad, there are not words to describe this. If you need one reason to read this book, NASH would be it. And then there was Tom, who wasn't my favorite. I didn't hate him, but he got on my nerves more than any of the other characters. I did wind up liking him in the end, though. So yay! You and Me and Him was very well written, and I was a fan of Kris Dennison's style. I was engaged right from the beginning, and can't really remember getting bored throughout. The novel didn't drag. I flew straight through the story without a problem. The only small damper was my lack of investment in any of the romantic aspects. Obviously I don't have to intensely ship a couple in every single book I read (though it is such fun! ), but I was hoping for more here. I was highly pleased with the friendships--and, as I mentioned, Nash and Maggie are the best and I ship that friendship forever--but I have to admit I missed feeling happy over romantic sweetness more than I'd like in this book. I still think this book is great, though. 4 stars - A fun, quirky story featuring the most heartwarming friendship! Kris Dinnison learned to read when she was five years old. She grew up reading books nobody else had read and listening to music nobody else had heard of and thinking she was weird, which she kind of was. She spent nearly two decades as a teacher and librarian working with students from kindergarten to graduate school. The bulk of that time she spent teaching High School English while dreaming of becoming a writer. Nowadays, when she’s not writing, she helps run her family’s retail and café businesses. 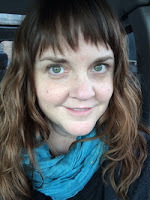 She lives and writes in Spokane, Washington. Three winners will receive a finished copy of You and Me and Him! - Enter through the Rafflecopter below! You and Me and Him sounds really interesting. I'm looking forward to reading it. Thanks for the giveaway. It sounds like a really fun read. If the characters are strong and the dialogue is witty, I'm willing to give it a look. Seems really fun and different from the usual YA contemporaries! I've already added it to my TBR! Great review, BTW! I have been really wanting to read about this exact plot, a bisexual love triangle between friends. It sounds so interesting. It reminds me of Fans of The Impossible Life by Kate Scelsa (out in September) with the friendship aspect you mentioned. :) Thank you for the giveaway! This book sounds great! I can't wait to read it. The book sounds like a great read. Love the cover as well! What a unique premise for a book! It sounds incredible! Looking forward to reading your book. It's my kind of book. Best of luck to you. This sounds like a great read! I am definitely adding it to my TBR list. I love the quirky cover, and based on the synopsis, this sounds like it will be a fun read! Sounds like a fun read...I couldn't imagine falling for the same guy as one of my male friends. What an intriguing premise for a book. Finally, a "love triangle" I am actually interested in reading! I have been reading more contemporary YA and this looks like a fun read.